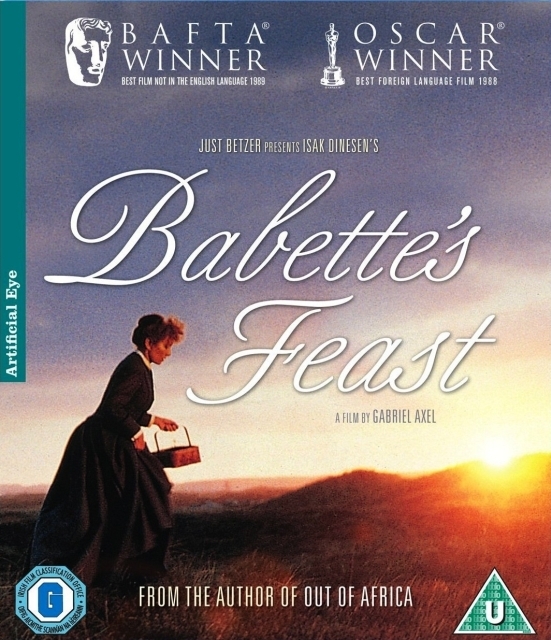 Babette’s Feast: a movie every foodie must watch! – Just For Sybarites! Not only the landscaping is gorgeous but thinking such a movie is 27 years old makes me analyze todays cinema, where everything happens so fast and there are no symbols for us to be interpreted.. The movie takes place in Denmark, in 1871, and it is a perfect orchestra where music, love, remembrances and food are the instruments playing in perfect harmony. A story that unfolds towards the end with an unexpected twist that will make you smile and cry at the same time. Messages of unconditional love, dedication, humbleness and a phrase that gives the whole movie away.. “an artist will never be poor”. Babette presents a menu that clearly sticks to the strict cuisine of the time of great Cafes at Paris. The golden age of french cuisine when a proper stock was made in more than four hours and a proper dinner took a couple of days to be prepared. The seven course meal that is depicted on this film, goes beyond any remote expectation. The food part starts at min 55 so please be patient! It is worth and by far my favorite movie as a chef. Here I attach the recipes (quoting literally from “Notes on Preparing Babette’s Feast” by T.W. Lapereau). There are certain ingredients that you can substitute (unless you feel like spending thousands of dollars, pounds or francs….) and there are ingredients you will be forced to substitute such as green turtle. As far as the wine selection, you can also play around just be respectful of the tastes, since each dish is extremely particular. NOTE TO READER: THIS IS HAUTE CUISINE, VERY DIFFICULT RECIPES! For many people cooking is just a craft, for many of us cooking is an art. You make the draft just like Da Vinci did, you plan and envision, you imagine tastes and gather the ingredients carefully measuring amounts. The art of making a dish is as complicated as writing an orchestra piece, each instrument must play at the right note on the accurate rhythm just like each wine must respect every aroma at the perfect time. Babette lets us know what this is about with such a natural gift and passion that you will feel carried away and probably run to your kitchen after watching this. I do hope you enjoy as much as I do every time I watch this piece of art. consomme (consomme blanc de veau) is considered ideal for making the turtle soup, above. and then add the vegetables, chicken, bouquet garni and salt. the bouquet garni and strain the stock into a clean bowl. the last remnants of the fat. the strength. Correct the seasoning with salt and pepper to taste. simmer, skimming often, until scum no longer rises to the surface. discard the bouquet garni and strain the stock through a cloth. frequented with the many women to whom he paid court. 1. In a large warm bowl soak the yeast in 1/4 cup of warm water. After about 10 minutes, add l cup of the milk. then fold these into the mixture. Let stand to rise for « hour. « minute longer. Remove the blini and keep warm in a low oven. Continue cooking until all of the blinis are made. 4. To serve, place the blinis on a preheated serving platter. On one half of each blini place heaping spoonsfull of the caviar. half of the blinis, pile the sour cream. water pour back into the butter. minutes. Drain the birds and set them aside to keep warm. the stock is nearly jelly-like in consistency. Keep warm. b: Gently spread the birds with the now jellied stock. c: Coat the birds with the chaud-froid sauce. slice and three large grapes. e: Serve on preheated plates. berries, and sage as listed in this recipe. white wine instead of water. will feel well rewarded. That is a promise. to the pan. Add these to the kettle. 2. Pour over cold water to cover and bring to a bare simmer. Skim and then add the vegetables, bouquet garni and salt. cook the vegetables and ham for 10 minutes, stirring occasionally. flour has turned golden brown. Remove from the flame. whisk the beef stock into the mirepoix (the vegetable mixture). (ideally in a double boiler, over but not in hot water). pepper and simmer gently for 6 hours, skimmng occasionally. Strain the stock through muslin. the Madeira and coat the birds. followed twice, once for each ball). to a 30 cm (12″) square and set the butter in the center of this. rectangle 90 degrees and roll out again into a large rectangle. completed, chill the dough for 2 hours before using. 10 cm (4″) in diameter. Place these on a damp baking sheet. edges with a knife, taking care not to cut all the way through. 1. Let all the ingredients come to room temperature. until doubled in bulk (about 1 hour). mixture until smooth and elastic. glazed fruits. Serve with well chilled Champagne. Next Post Stop overeating and lose weight!